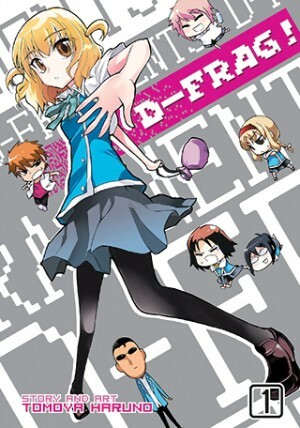 Because several titles on my manga list have gone into hiatus, combined with the fact that I needed one extra something to make an online order so that I could get free shipping, I decided to go with D-Frag because (1) Seven Seas (GoManga) is doing it (meaning Japanese honorifics should be retained) and (2) I saw non-spoiler reviews speaking of how whacky and insane it was. Boy were those reviews ever correct. In brief, the manga is about a wanna be thug named KAZAMA Kenji, who along with his two friends Yokoshima and Hiroshi, are trying to “take over” their school. Kazama is actually a nice guy underneath, so when his attempt to raid the Game Development Club for stuff to steal gets thwarted when he sees the four girls that make up the club have set fire to the club room. He puts out the fire, but then his companions are knocked out by the girls and the club president, Roka, soon teaches Kazama a lesson on how insane they all are with her “darkness” affinity. He’s forced to join their club, where he finds they are in a battle with the REAL Game Development Club, lead by Takao, who challenges them to a game development battle that will determine if Roka’s club lives or dies. I’ve said this in other reviews, but for me, unexpected, whacky moments are what I find the funniest. Haruno-sensei has this element down in droves. I mean right from the get go, the whacky, unexpected humor starts with Kazama walking into the Game Development Club’s room and discovering they’ve set it on fire. Then Roka attempts to deny there’s a fire by saying it is simply an illusion. A little later (after a lot more whacky comedy), Roka is blaming the fact that it isn’t summer for her using fireworks in the club room, which ultimately lead to the fire Kazama put out. That’s just a sample going the very minor spoiler route, and we haven’t even gotten half way through the first chapter. I’ve wrapped this section in a spoiler tag because I want to go a bit deeper into the comedy aspect of the manga. The four girls of this Game Development Club all claim an affinity for either fire (Roka), water (Sakura), lightning (Ohsawa-sensei), and earth (Chitose). So when they fight, they use their “element.” But then when Roka’s attempts at types of “fire” fail, she goes with her true affinity, darkness, whereby she has a bag on someone’s head, or she has blackout curtains drop to surround the person. And yes, you did see “sensei” in that list of names because Ohsawa-sensei is the club’s adviser, and she’s “lightning” because she carries a Taser with her at all times. Starting to get an idea of the completely unexpected, insane, and whacky nature of this manga? If not, then you should know that Chitose is actually the student council president, and she’s “earth” affinity because as she states in this volume when she punches Kazama, she was just building a sand castle, thus still has sand on her hands, thus her punch has to be an “Earth Punch” attack. 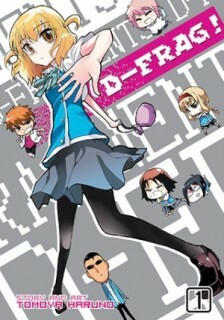 I don’t think a manga has ever had me laugh as much or as hard as D-Frag did because while there have been good, whacky comedy series that I’ve read, D-Frag just does not let up. Haruno-sensei has his foot hard on the gas pedal, making this just a really wild and insane ride. Did I say “insane”? You bet. The whole premise is insane, which makes it so deliciously wonderful. Seriously, a wannabe delinquent gets forced into joining a whacky club, with nutty female members? I immediately liked this girls and just got caught up in their almost chuunibyou-like way of thinking they have elemental powers (which they do, after a fashion). There’s a sadistic streak in all four of the girls in the Game Development Club, and I just loved it. Visually, Haruno-sensei’s art looks nice. The female characters can look quite attractive when needed. At the same time, he knows how to do the super deformed stuff pretty well. Roka gets the most of this, as Haruno-sensei seems to have partially modeled her on Misaka Imouto from A Certain Scientific Railgun (or A Certain Magical Index, whichever you prefer). That gives Roka a deceptively slow and stupid appearance at times, which of course is not the case at all. Even in the omake part of the manga, Haruno-sensei still does the humor by poking a bit of fun at himself, but also at how he apparently took the idea his editor gave him about doing a video game manga and turned it into the insanity of delight that is D-Frag! On the Seven Seas side of things, Japanese honorifics are retained and Japanese names are in their proper order of family name first, followed by the given name. We get a two color pages at the beginning and whatever extras appear to have come in the tankoubon. No translator notes are present. The other extra is a preview of chapter 1 on Haganai. I’ll have to watch the manga after I’ve read more manga. I’m loving the comedy madness here. You just have no clue what to expect next, and everything is just another insane moment that is often laugh out loud funny.